To request a refund on a payment you made, follow these few steps. 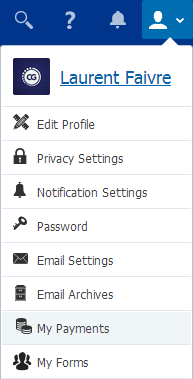 Click on the "My Profile" icon and then on "My Payments" to display all your payments. 3. 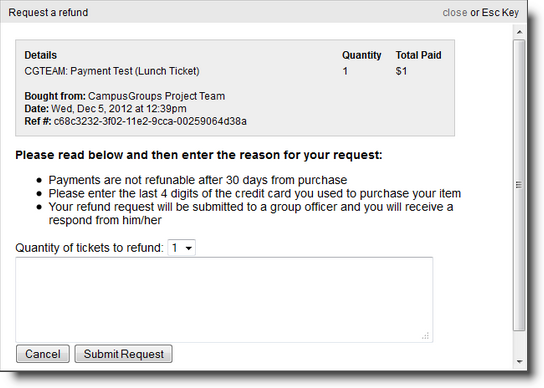 Click on the "Request Refund" button next to the payment for which you would like to get refunded. Please note the "Refund Request" is an optional tool. If you don't see this button, it's probably because your school does not have this feature set up. Please contact the support for more information. 4. Complete your request indicating the quantity in the dropdown and adding a few words in the message box to describe your request. Then click on "Submit Request". 5. Once submitted, the group officer will be notified so that he/she can review your request and reply by granting you a complete or partial refund or denying your refund with a message justifying the decision. 6. If a partial or complete refund is granted, you will then be informed by the following comment on your "My Payments" page when the refund gets completed.